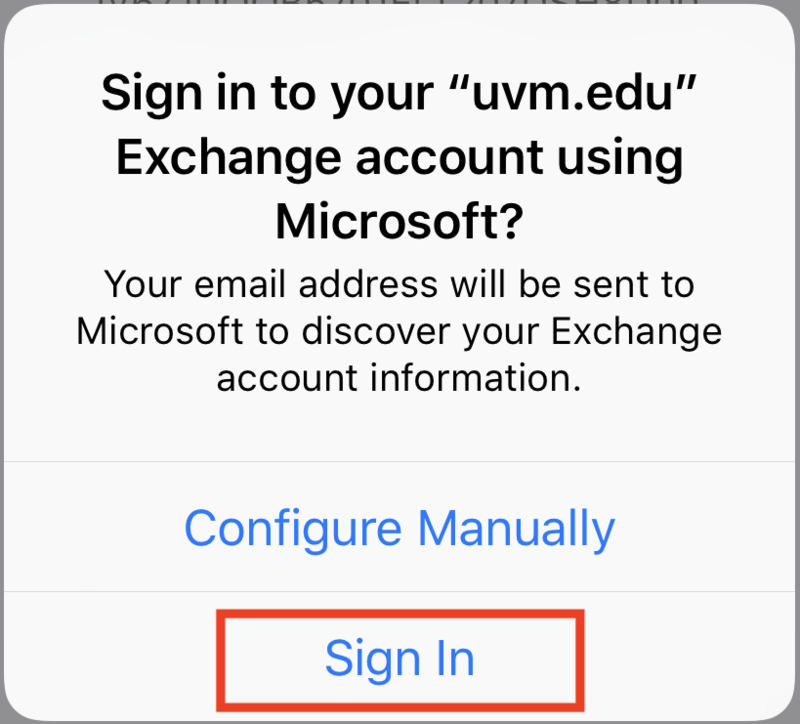 The University of Vermont utilizes Microsoft Exchange as our primary email, calendaring, contacts, scheduling, and collaboration platform. 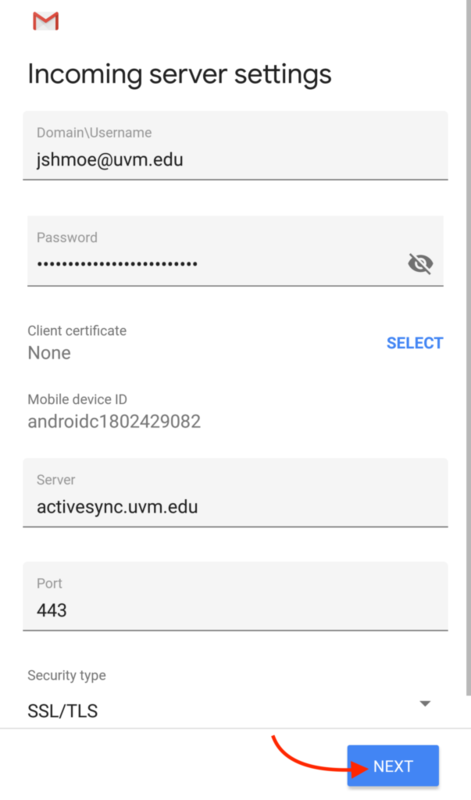 All current UVM affiliates with an active NetID account are provisioned with Exchange access. The guides below will walk you through the process of adding your UVM Exchange account to various devices. 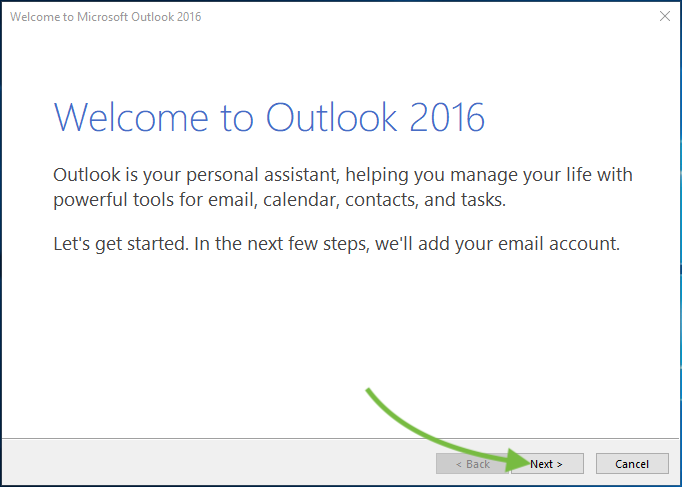 Open the “Outlook 2016” application. 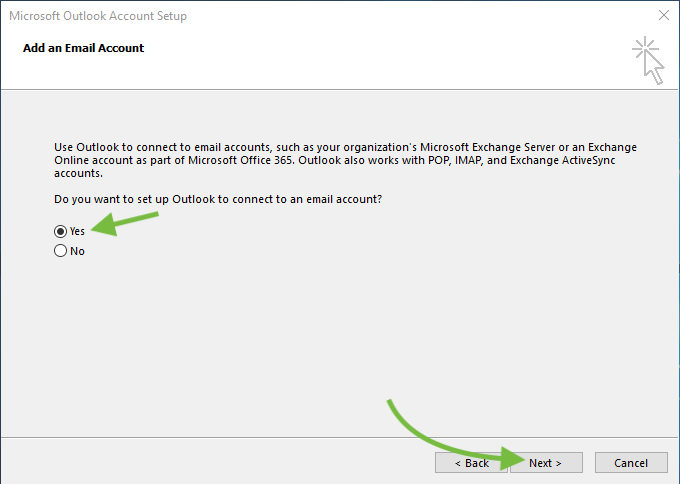 If this is your first time launching Outlook, you’ll receive a prompt to add an email account. 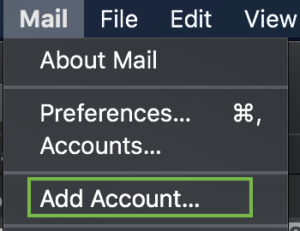 You can also add accounts via the “File” –> “Account Settings” menu. 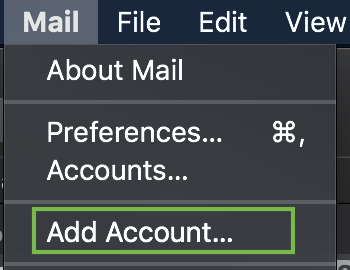 Choose to add an email account, then click “Next“. 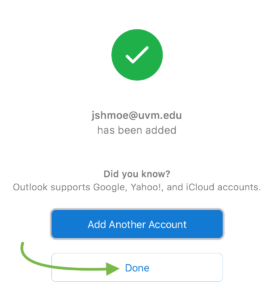 Enter your UVM account information. 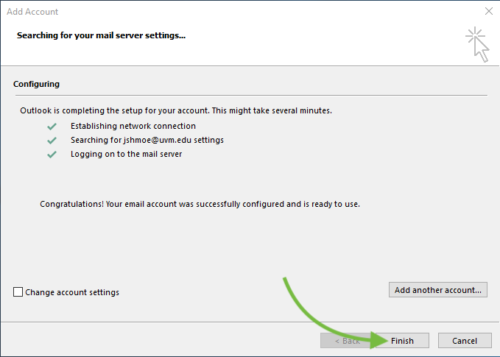 The “E-mail Address” should be entered in NetID@uvm.edu format. Enter your NetID password in the Password fields, then click “Next“. 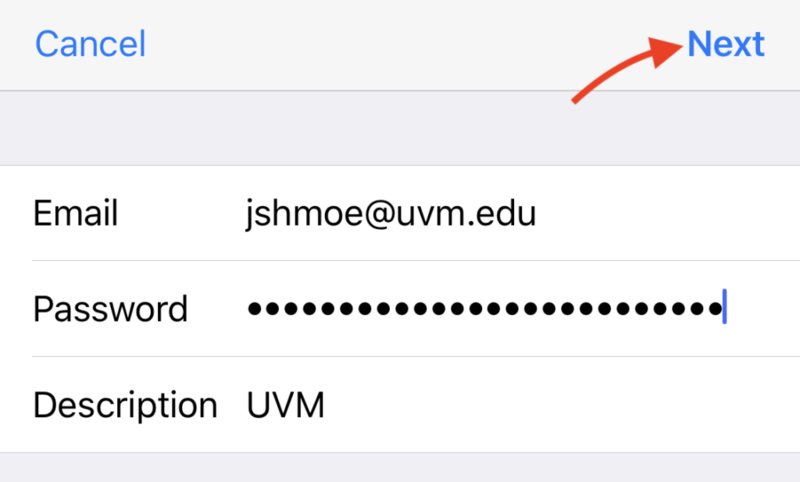 Please note, using firstname.lastname@uvm.edu when setting up your account may result in errors. Please enter your email address in the NetID@uvm.edu format. You may receive an additional prompt for your NetID password. 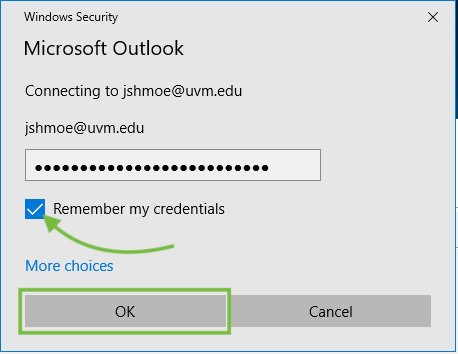 If you do, enter your NetID password and choose the “Remember my credentials” checkbox, then click “OK“. 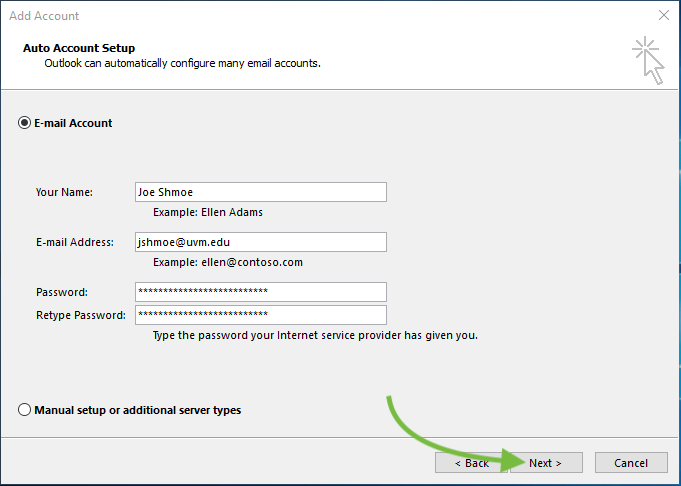 Click “Finish” to complete the account setup wizard. 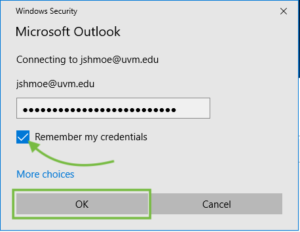 If this is your first time launching Outlook, you’ll receive a prompt to enter your email address. 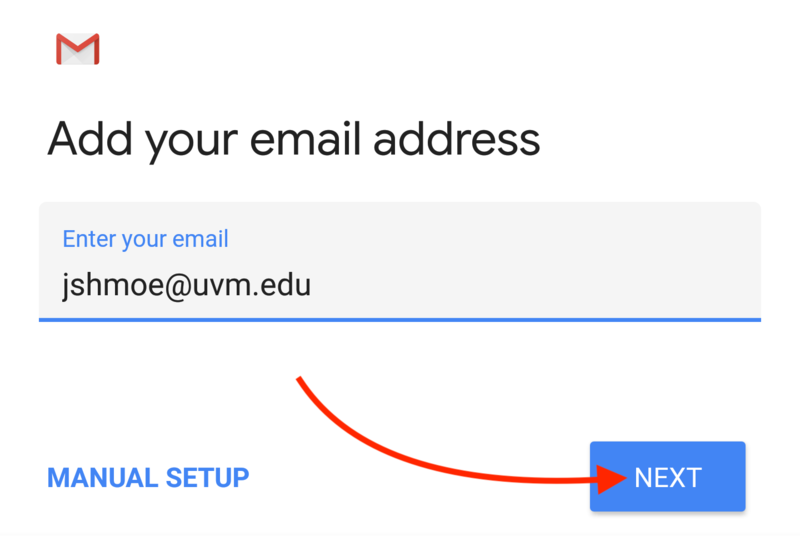 Enter your UVM email address in NetID@uvm.edu format. 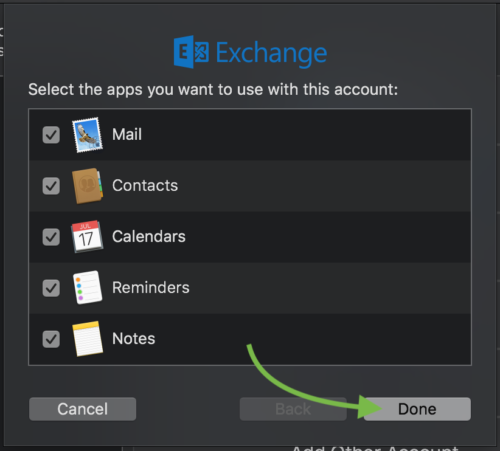 You can also add accounts from the Outlook –> Preferences –> Accounts menu. 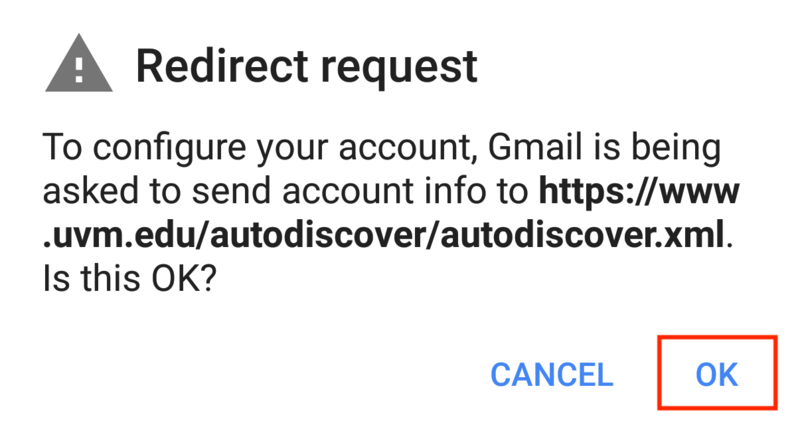 After entering your account information, click on “Add Account“. 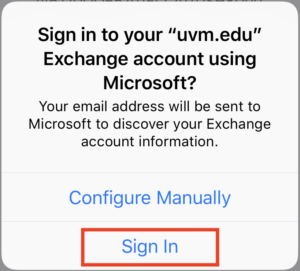 Your UVM Exchange account is now added to the Outlook mail client. 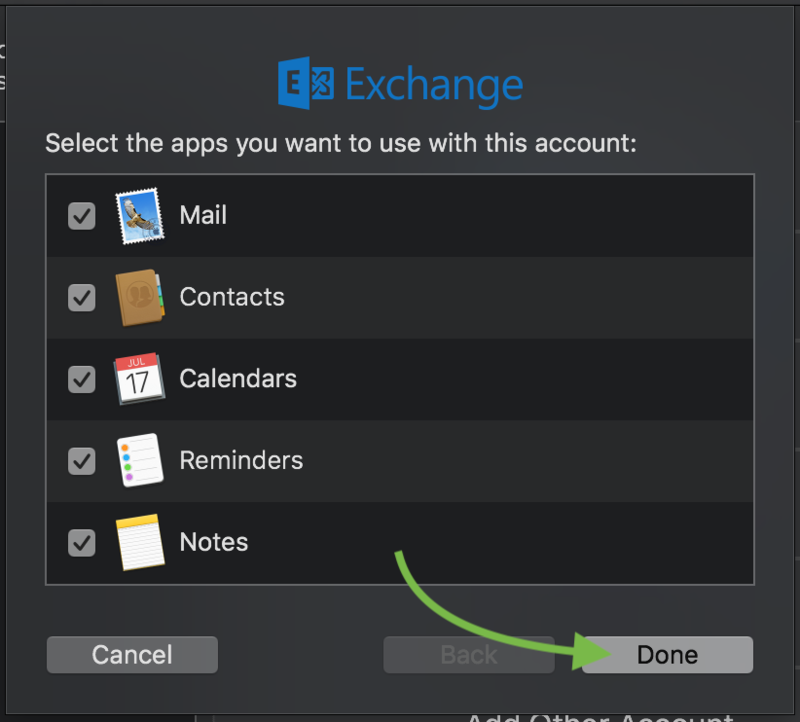 Click the “Done” button to exit the account setup wizard. 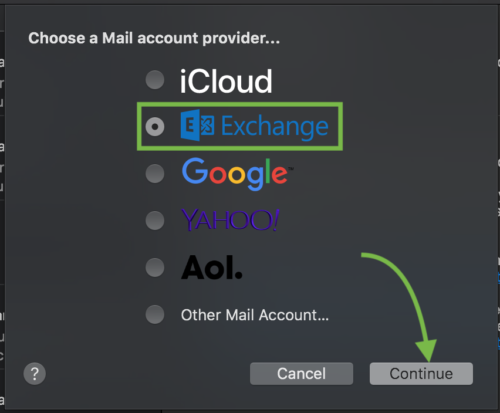 Choose “Exchange” as the account provider, then click “Continue“. 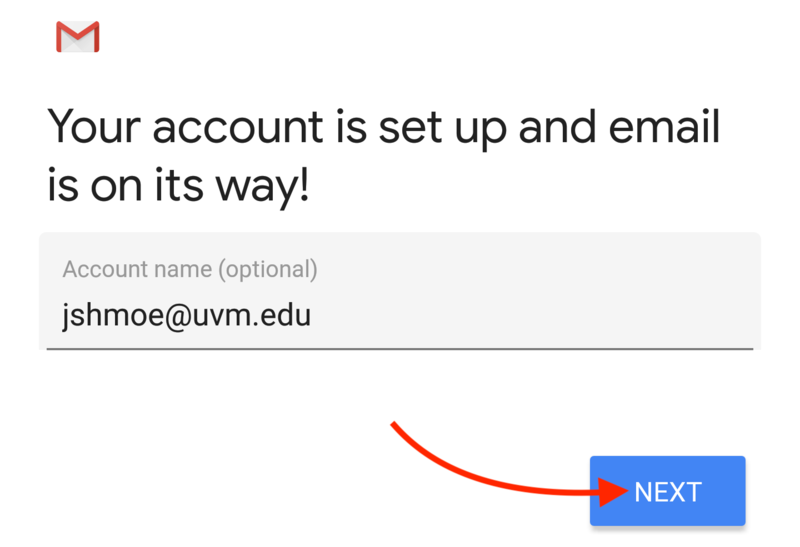 Enter your full name, and your UVM email address in NetID@uvm.edu format. Then click “Sign In“. Choose the “Configure Manually” button. 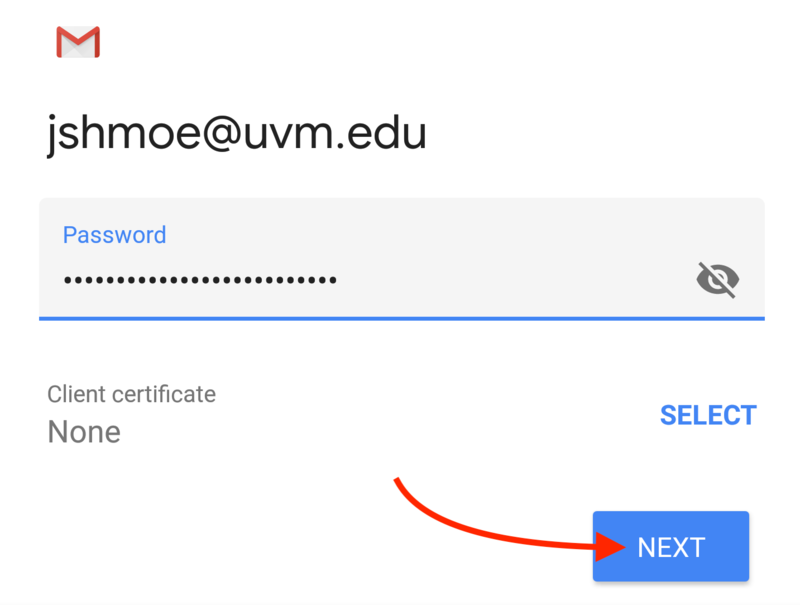 Enter your UVM NetID password, the click “Sign In“. 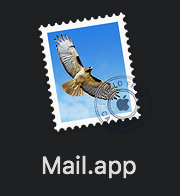 Select the content you’d like to sync with your Mail client, then click “Done“. 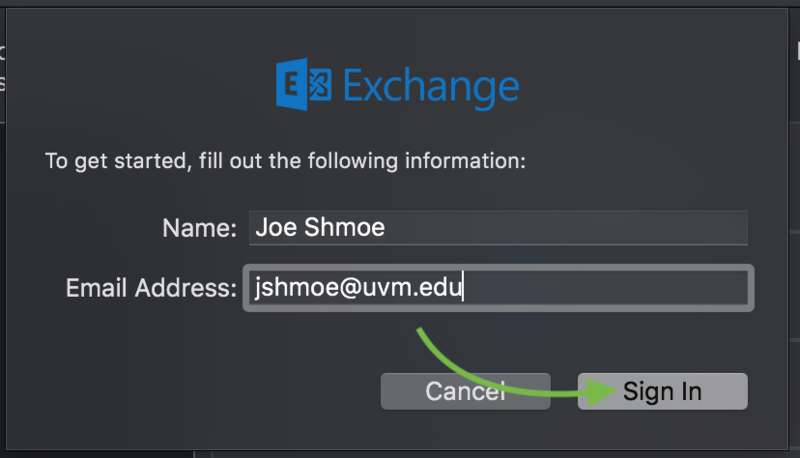 You’ve successfully added your UVM Exchange account to your Apple Mail client. The Outlook mobile app for iOS and Android has been blocked for the time being due to security concerns. Please use the guides below to add your UVM email account to your mobile device. This guide was created on a device running iOS 11. Before proceeding, ensure your iPhone or iPad device has an active connection to the Internet. 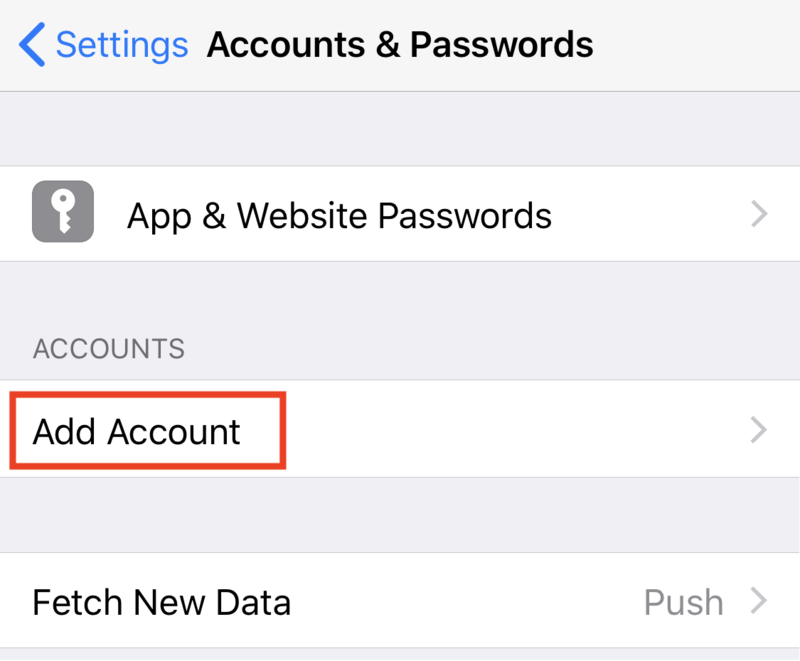 Open the “Settings” app and tap on the “Accounts & Passwords” menu. Tap on the “Exchange” option. 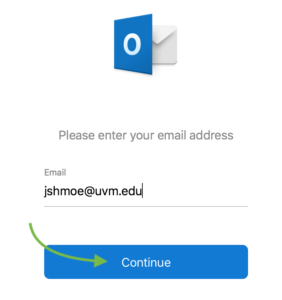 In the “Email” field, enter your UVM email address in netid@uvm.edu format. 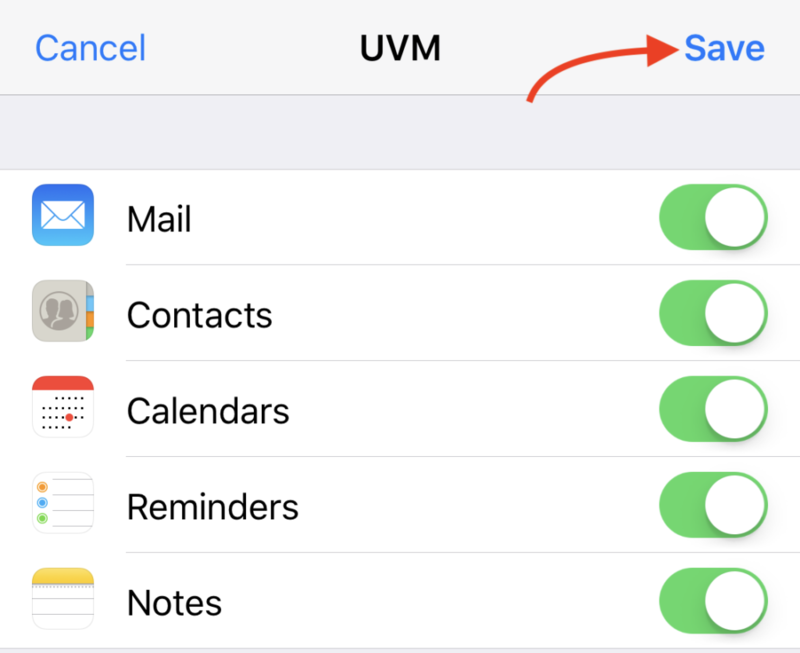 In the “Description field, enter “UVM“, then tap “Next“. 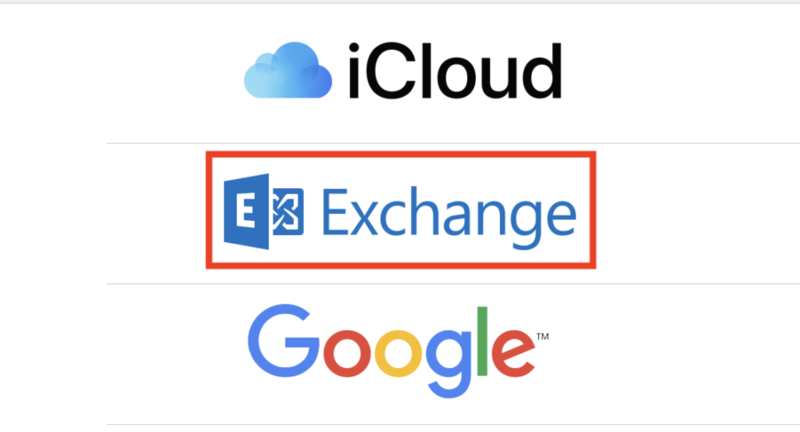 You’ll receive a prompt asking if you’d like to sign in to your Exchange account using Microsoft. Tap the “Sign In” option. 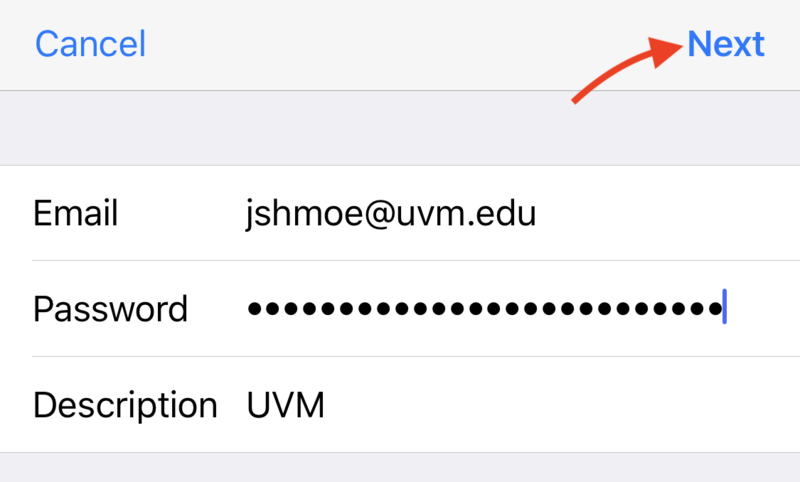 In the “Password” field, enter your UVM NetID password, then tap “Next“. You’ll be asked to choose which items you’d like to sync with your device. 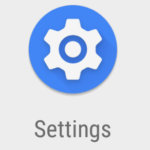 ETS recommends leaving all toggles switched “On”. 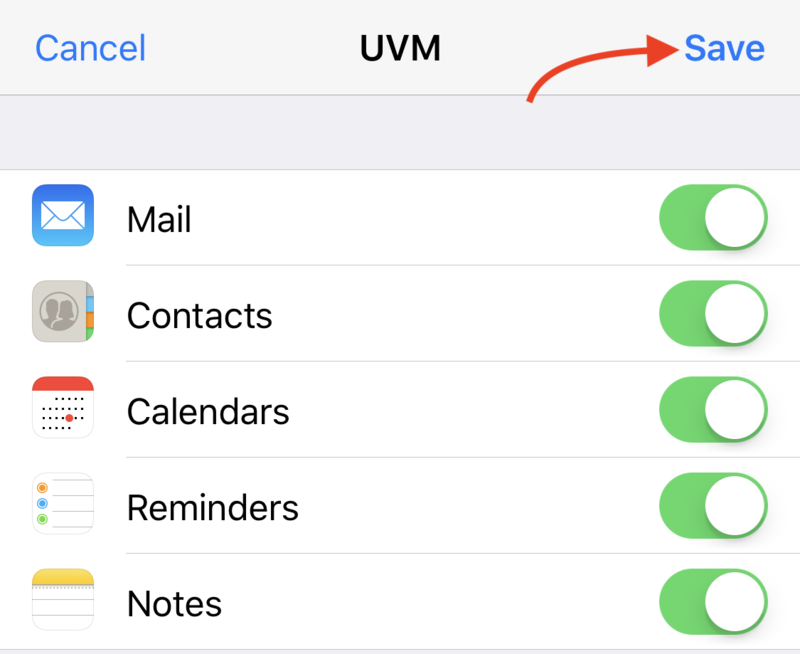 When you’ve finished adjusting your sync settings, tap “Save“. That’s it! 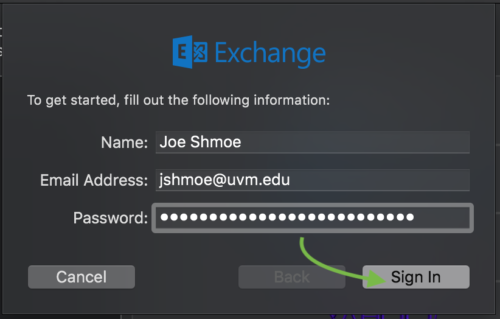 You’ve successfully added your UVM Exchange account to your iOS device. 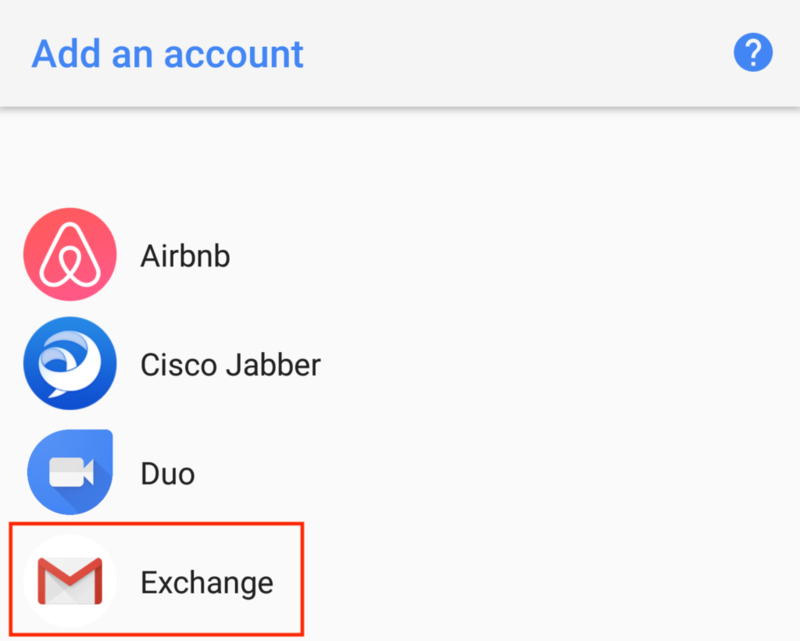 Some Android devices may have slightly different menus and settings when adding an Exchange account. However, in general the process should be similar enough to follow the steps outlined here. 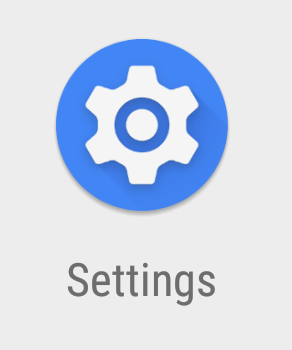 Open the “Settings” app on your Android device. Scroll down and tap on the “User & accounts” settings option. Scroll down to the “Add account” option. 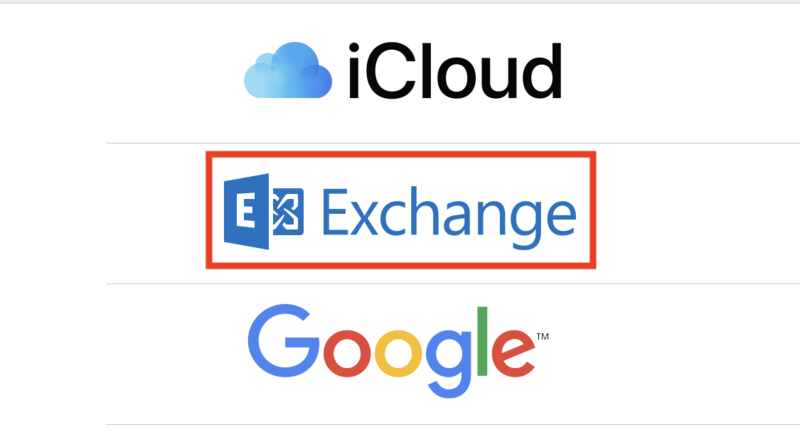 From the list of account types, select “Exchange“. Enter your UVM email address in netid@uvm.edu format. Then tap “Next“. 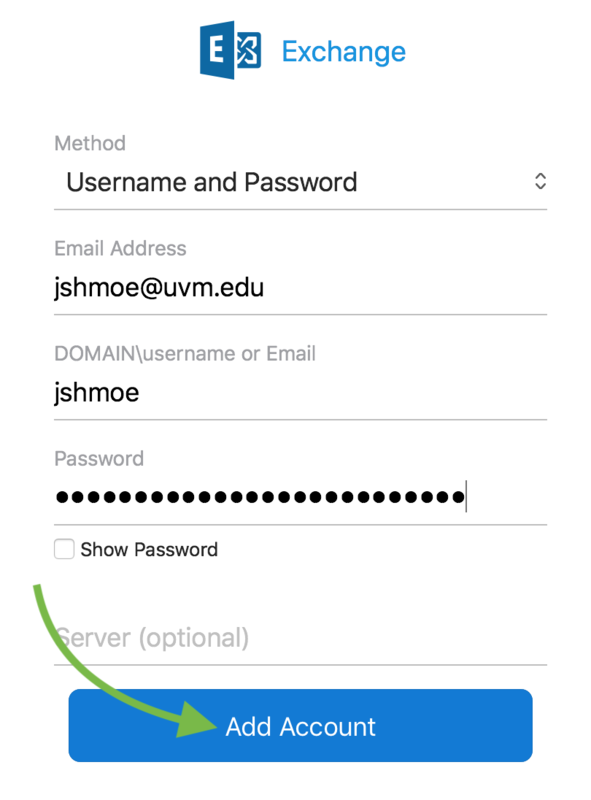 Enter your UVM NetID password. Then tap “Next“. 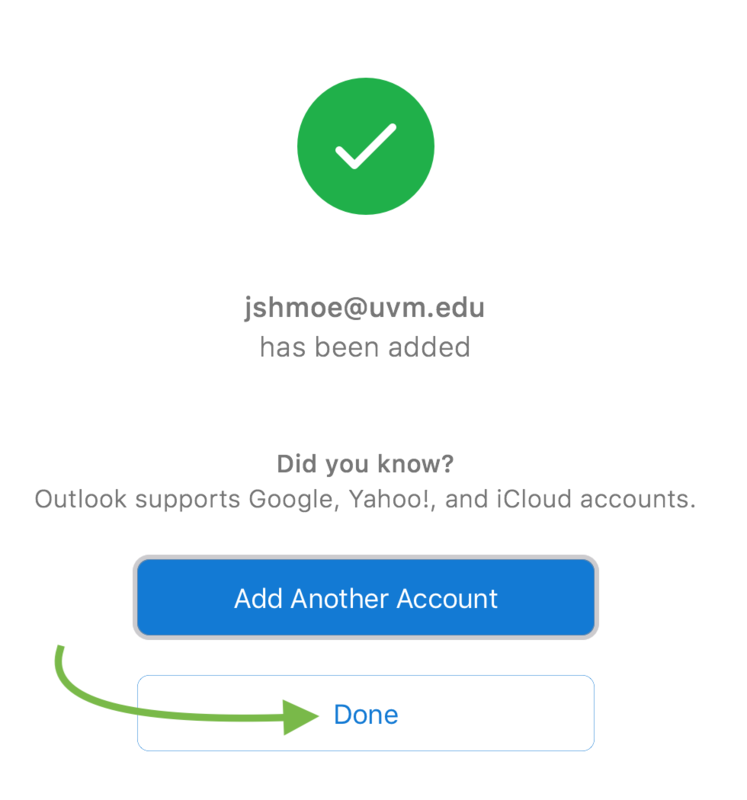 You may receive a Redirect Request prompting for permission to send account info to uvm.edu/autodiscover, tap “OK“. Account configuration should complete automatically. Tap “Next” to continue. 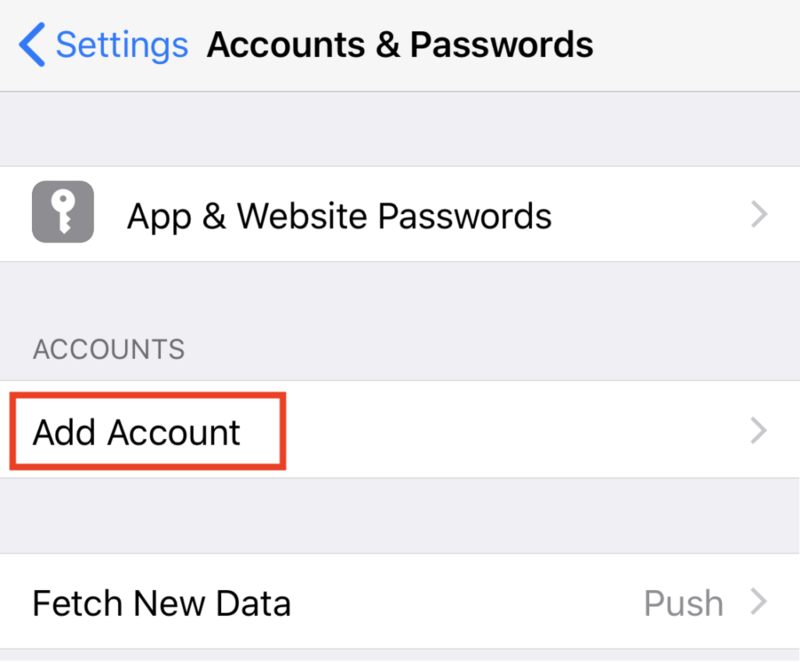 If your account information is not configured automatically, please try re-entering your password and/or check your Internet connection. 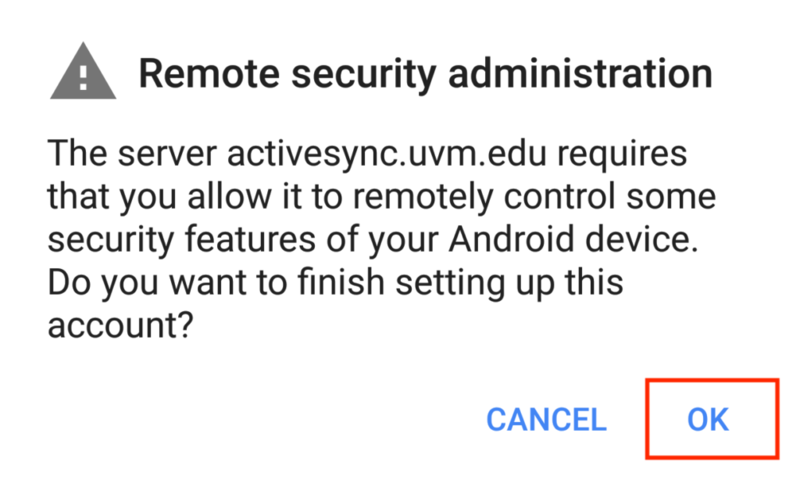 You may receive a Remote Administration request, tap “OK“. 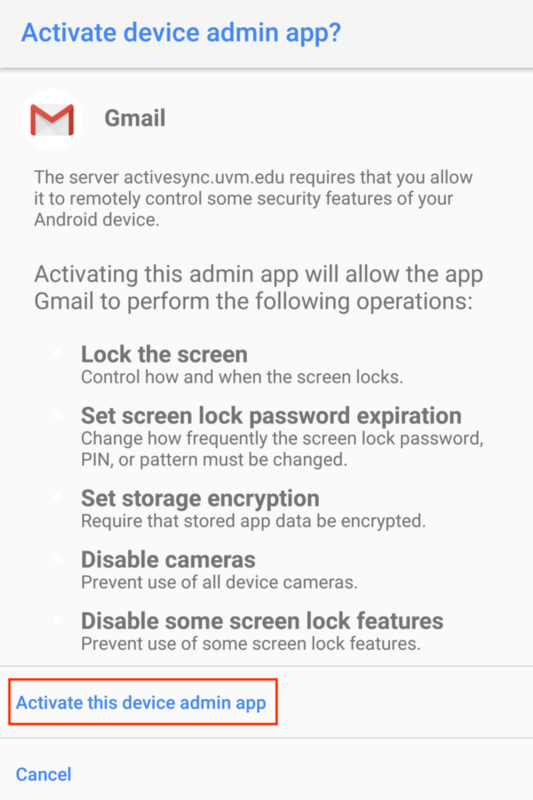 Allow remote security features by scrolling down to and tapping on “Activate this device admin app“. 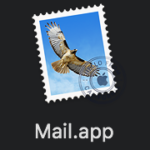 Tap “Next” to complete the setup process. You have successfully added your UVM Exchange email and calendar account to your Android device.